First edition hard back. Colour frontispiece. Illustrated by Ernest Shepard. In Very Good condition, no dust wrapper. Member of the P.B.F.A. 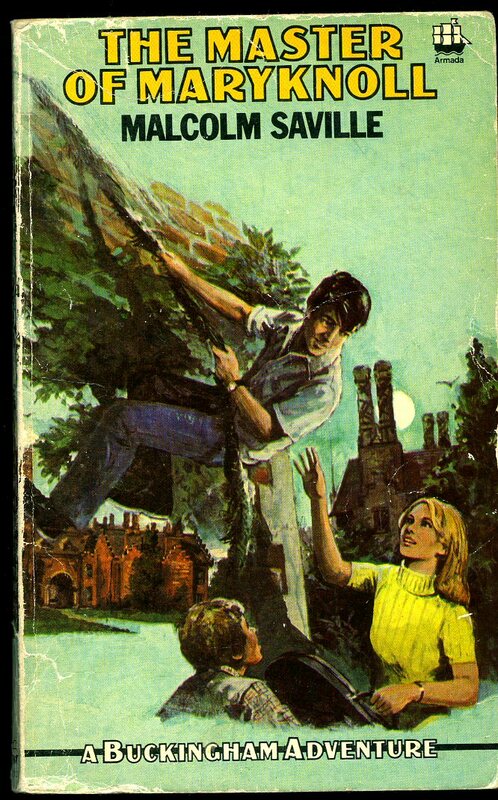 Published by Cassell & Company, Ltd., 37-38 St. Andrew's Hill, London First edition 1962. 1962. Published by Armada, London 1976. 1976. Paperback. Creases to spine gutters and corners. This book belongs to not filled in. Illustrations by Alice Bush. Member of the P.B.F.A. 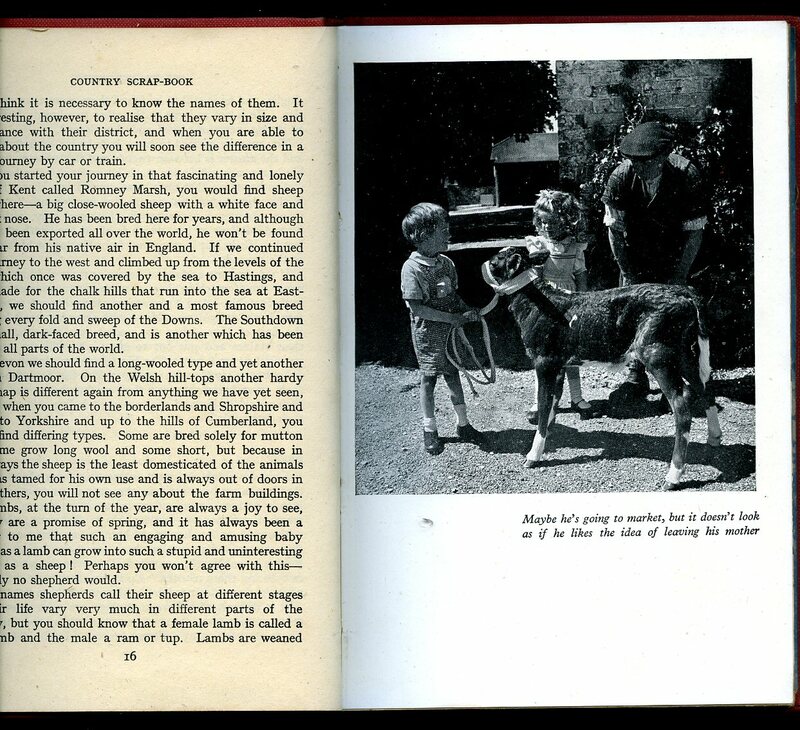 Published by Gramol Publications Ltd., London and Chesham Second Enlarged Edition 1945. 1945. Hard back publisher's original cerise cloth covers, gilt stamping to spine and upper panel. 8vo 7½" x 5" 144 pp. Monochrome photographic illustrations on glossy paper. In Very Good condition, no dust wrapper. Member of the P.B.F.A. 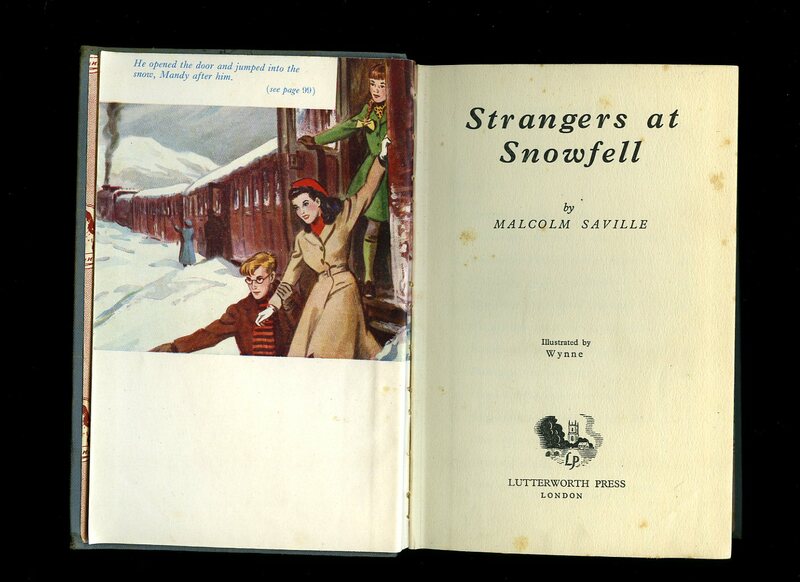 Published by Lutterworth Press, London and Redhill First Edition 1949. London 1949. 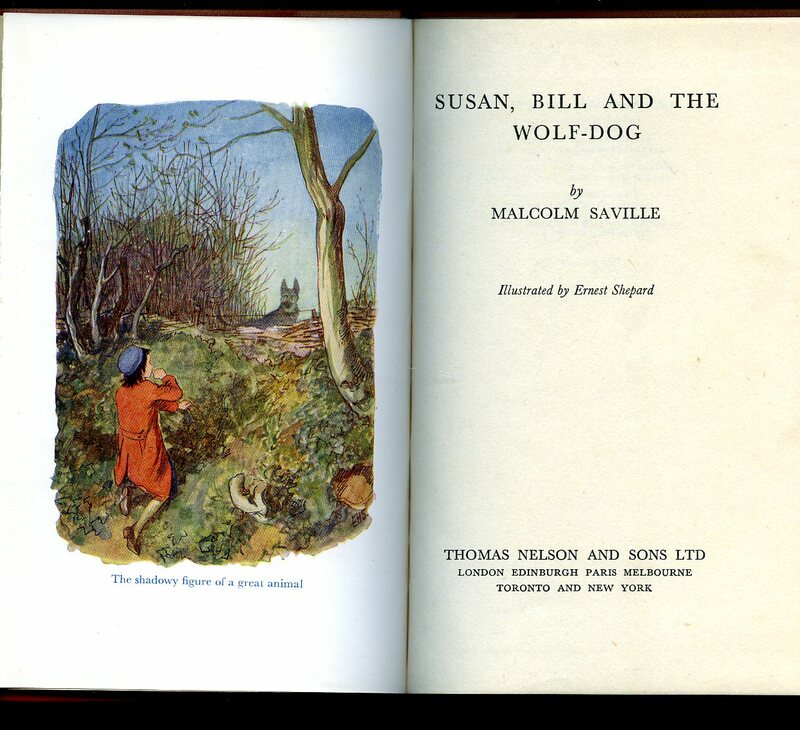 First edition hard back binding in publisher's original grey cloth covers, silver lettering to the spine and the upper panel, cherry end paper illustrations. 8vo 7½'' x 5¼'' 231 printed pages of text. 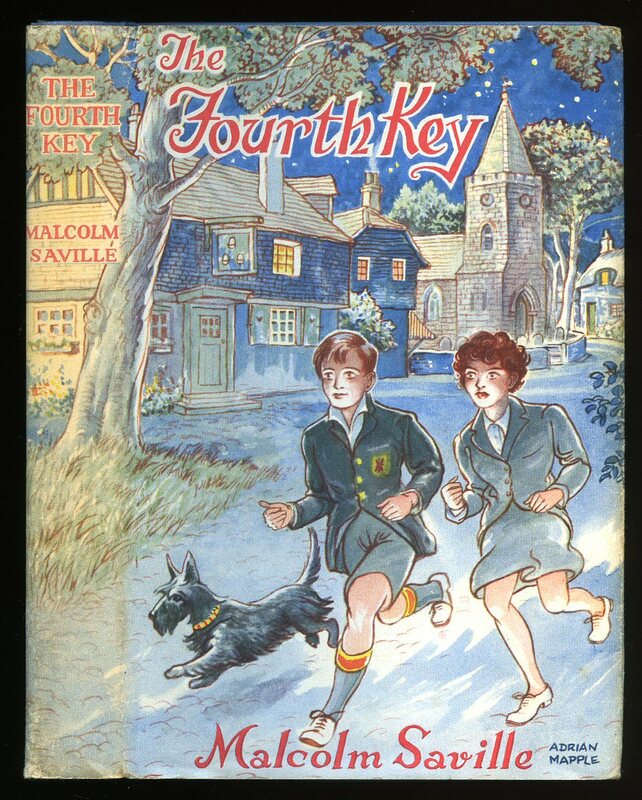 Colour frontispiece, monochrome illustrations throughout. Foxing to the page edges, bumps to the covers, no dust wrapper. Member of the P.B.F.A. 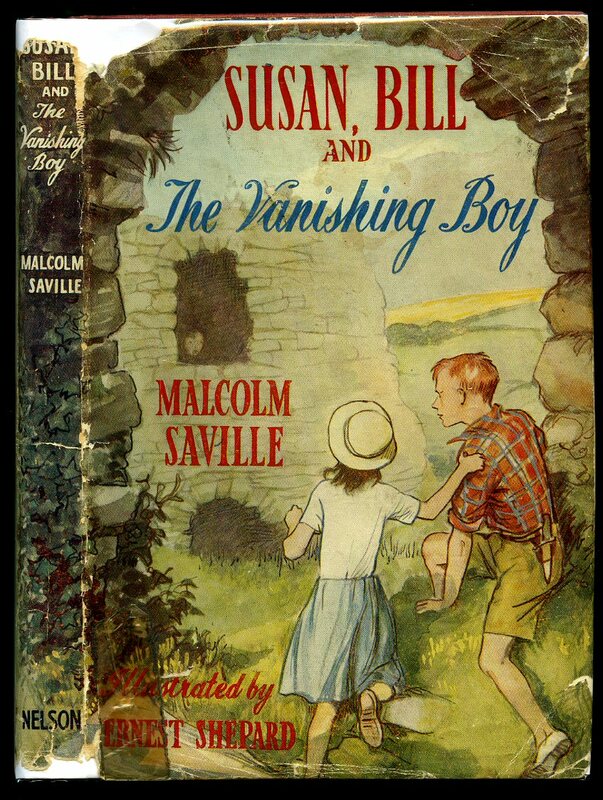 Published by Thomas Nelson and Sons Ltd., 35-36 Paternoster Row, London First Edition 1955. 1955. First edition hard back binding in publisher's original scarlet paper covers, black lettering to spine and upper panel. 8vo 7¼" x 5" 120, 2 [pp]. 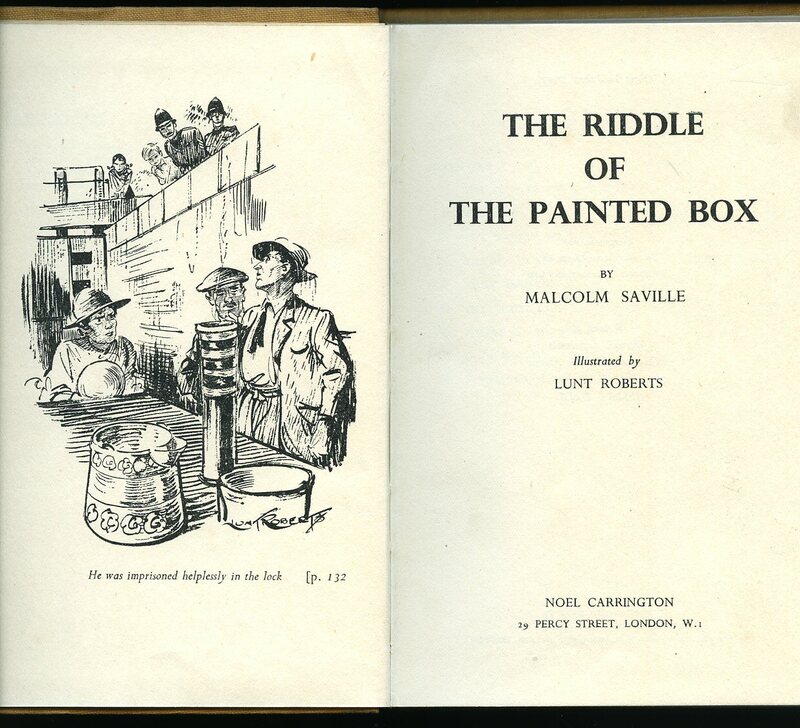 Colour frontispiece and six monochrome illustrations by Ernest Shepard. Prize plate to upper paste down, fox splashes to end papers. Very Good in Nr. Very Good price clipped dust wrapper with shallow chips and repaired tears to spine ends and corners. Dust wrapper supplied in archival acetate film protection. Member of the P.B.F.A. 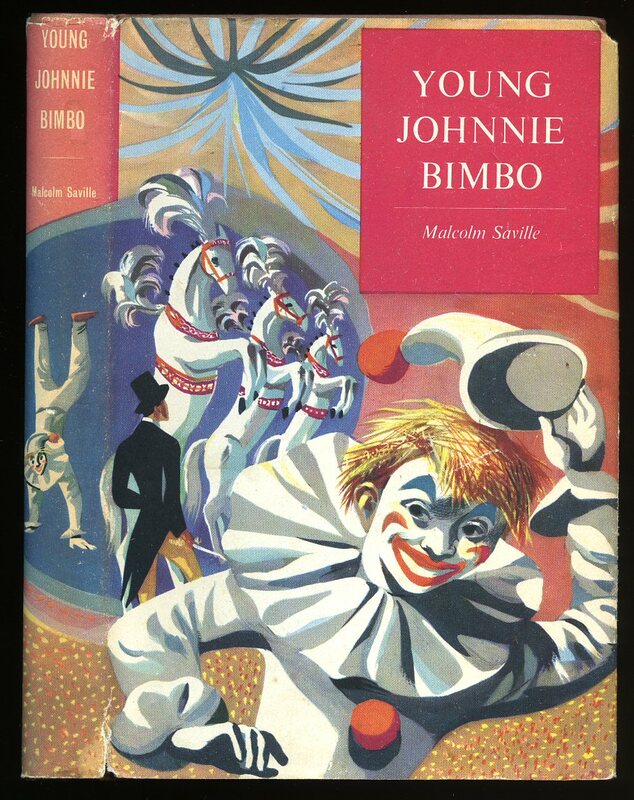 Published by The Children's Book Club 121 Charing Cross Road, London First thus edition circa 1958. 1958. Hard back binding in publisher's original blue paper covers, black lettering to spine. 8vo 7½'' x 5¼'' 182 pages. Monochrome illustrations. Dusty top edge. Nr. Fine in Very Good different artwork dust wrapper to first edition with slight age darkening to lower panel, without any tears or chips, not price clipped 9s 6d. Dust wrapper supplied in archival acetate film protection. Member of the P.B.F.A. 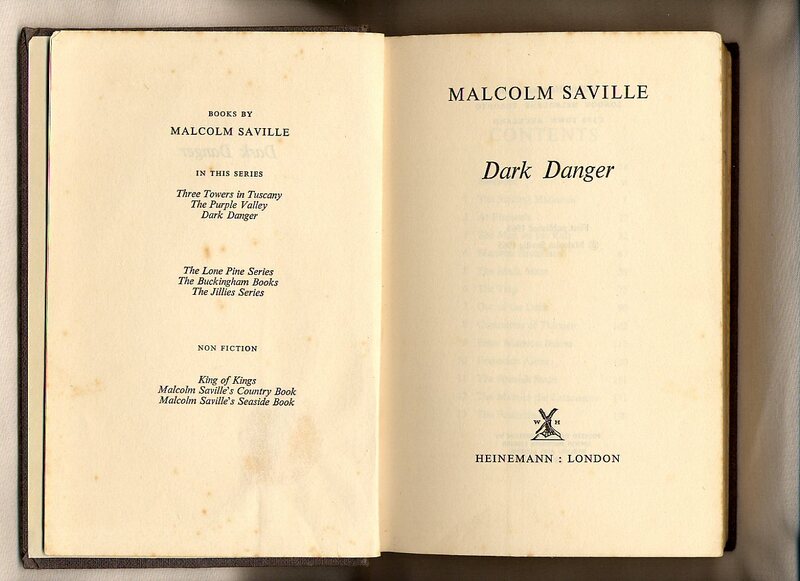 Hard back binding in publisher's original beige paper covers, black lettering to spine. 8vo 7½" x 5¼" 184 pp. Monochrome illustrations. Dusty top edge. Nr. Fine in Very Good different artwork dust wrapper to first edition with shallow rubs to spine tips and corners, age darkening to lower panel, not price clipped 9s 6d. Dust wrapper supplied in archival acetate film protection. Member of the P.B.F.A. Published by Noel Carrington, 29 Percy Street, London First Edition 1947. 1947. First edition hard back binding in publisher's original light orange cloth covers, navy lettering to spine and upper panel. 8vo 7½" x 5¼" 164 pp. Former name to front end paper, spine slightly faded and in Very Good condition, no dust wrapper. Member of the P.B.F.A. 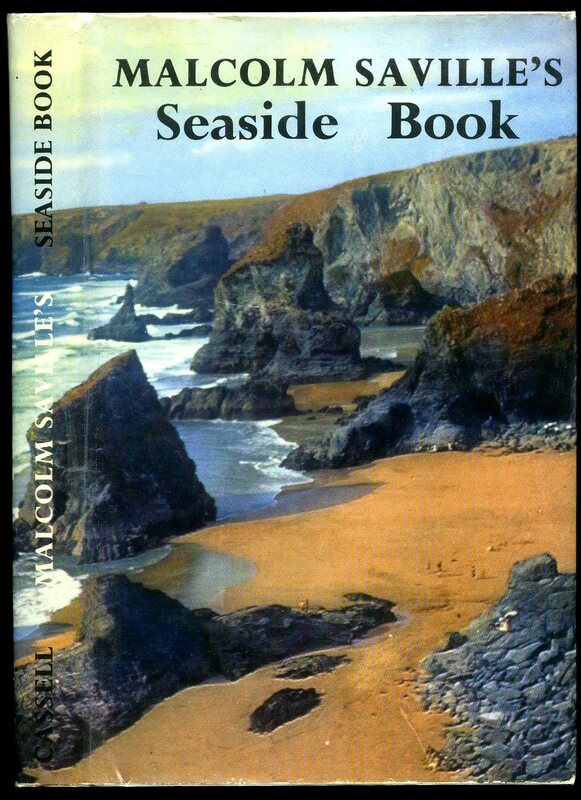 Published by William Heinemann Limited, London First Edition 1965. London 1965. First edition hard back binding in publisher's original grey covers, gilt lettering to the spine. 8vo 8'' x 5¼'' 196 printed pages of text. Crossed out school stamp to the front free end paper, foxing to the page edges, no dust wrapper, reading condition copy. Member of the P.B.F.A. Published by The Malcolm Saville Society 10 Bilford Road, Worcester Winter 1996-7. 1996. Publisher's original stapled card covers. 8vo 8½'' x 6''. Monochrome illustrations throughout. Society News, Special Features, Bibliographical Notes. In Fine condition, no dust wrapper as published. Member of the P.B.F.A. Acksherley! 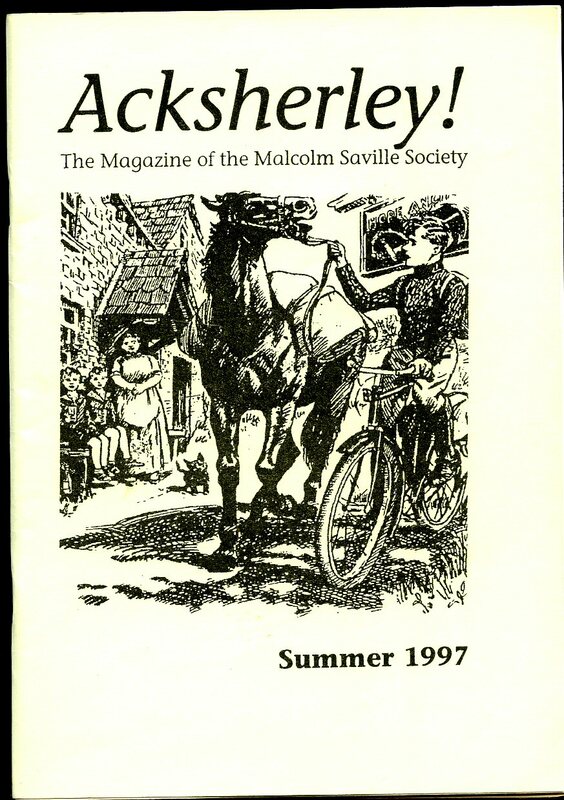 The Magazine of the Malcolm Saville Society Summer 1997. 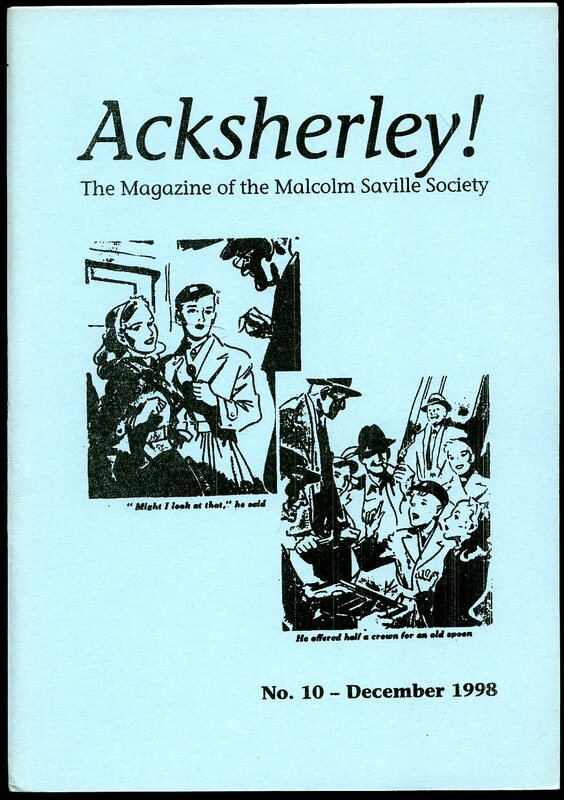 Published by The Malcolm Saville Society 10 Bilford Road, Worcester Summer 1997. 1997. 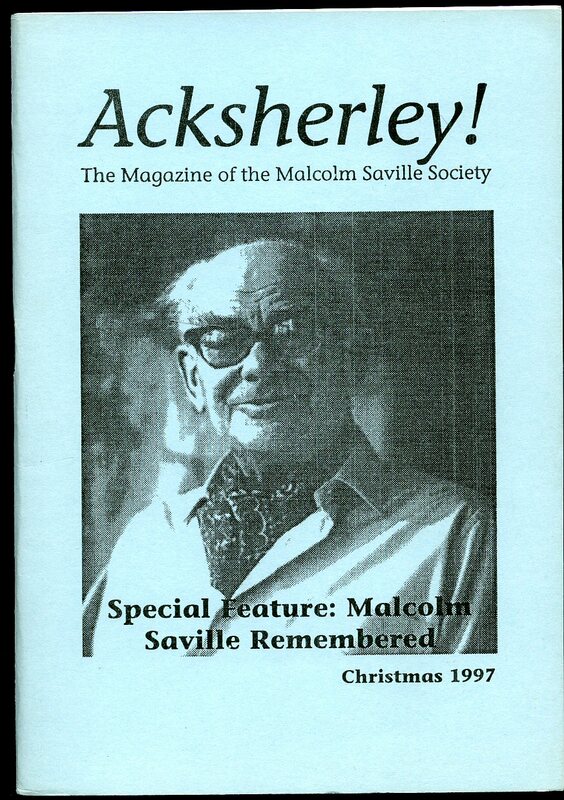 Published by The Malcolm Saville Society 10 Bilford Road, Worcester Christmas 1997. 1997. 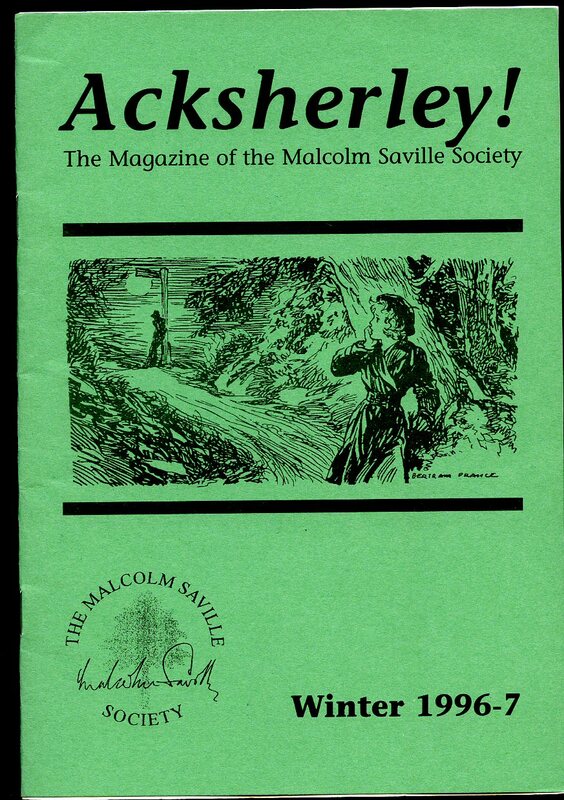 Published by The Malcolm Saville Society 10 Bilford Road, Worcester December 1998. 1998. 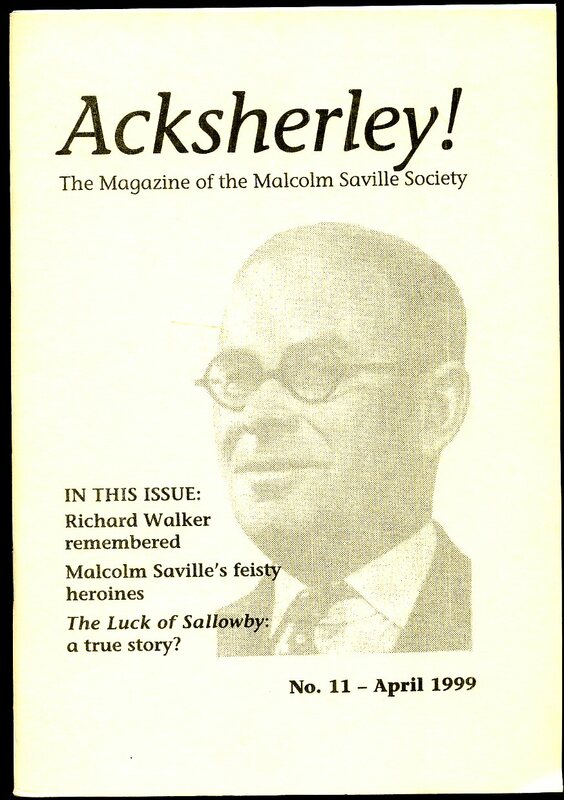 Published by The Malcolm Saville Society 10 Bilford Road, Worcester April 1999. 1999.